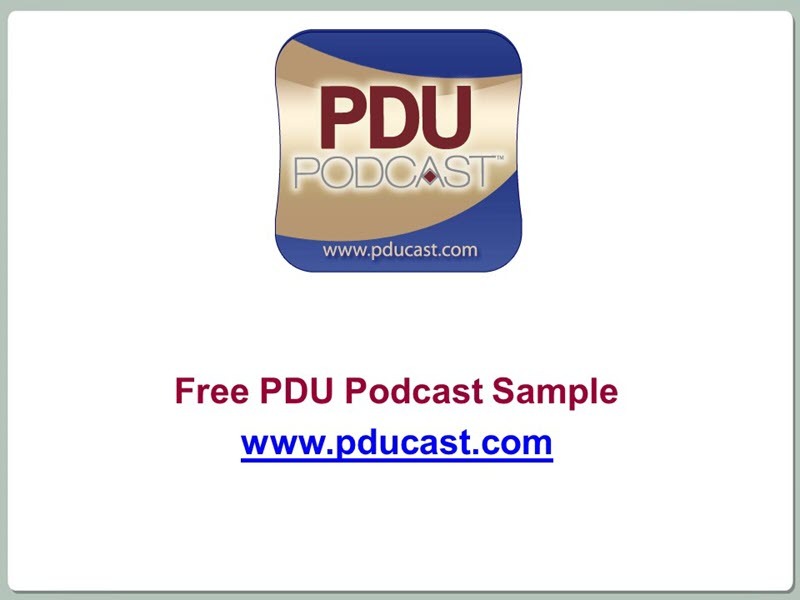 The first minute of this free lesson is a quick preface about PDU Podcast features and functionality. Feel free to fast forward. Please note that the transcript is provided for promotional purposes only. Transcripts are not provided for other PDU Podcast webinars. Cornelius Fichtner: Hello and welcome to this Free PDU Podcast sample. My name is Cornelius Fichtner. I am the host of the program. In the next 10 minutes or so, you are going to see a shortened version of an actual webinar taken from The PDU Podcast™ series. The idea is to give you an idea of what our webinars are like and allow you to try them on your portable media player. That’s why we give you both a high-resolution and a low-resolution version of each of our free podcast samples here. Copy them to your player and try them out. To find out more and order your full subscription to The PDU Podcast™, please go to www.pducast.com that’s p-d-u-c-a-s-t .com. And now here’s your sample webinar. Cornelius Fichtner: Welcome back to Effective Meetings for Project Managers. This is Part 2. My name is Cornelius Fichtner and here is your presenter, Steve Kaye, with the third question that your CEO is going to ask. Steve Kaye: So you have just explained to the CEO how the meeting is going to make money for the business, that’s the ‘why you’re holding it.’ The CEO is becoming more impressed and so now the CEO asked you the third question, which is: “Okay, how are you going to do this?” This is your plan. This is the project plan for your meeting. Steve Kaye: Step 4 is then Write the Agenda. Design the plan. Cornelius Fichtner: Okay. Are there any topics that you would recommend that we should include into a written agenda every single time? Like we’ve defined the goal. We’ve defined the purpose. Should a review of these two items be at the beginning of the agenda just to bring everybody together or are there any other items that you’d say these got to be on? Steve Kaye: Yes. An agenda should contain some very specific things. Although let’s go to a very global concept. You’re writing this agenda. Of course for yourself because this is your map. This is your plan for conducting the meeting. You’re also preparing this agenda so it can be used as a tool by the participants to maximize their effective participation in your meeting. The more effectively they participate in your meeting, the shorter the meeting, the better the results and the more likely it will be that everybody actually implements the action items that come out of the end of the meeting. So what do you put in it? Steve Kaye: At the beginning, you would put the goal for the meeting. This tells people what you are planning to do. You would then tell them why you are doing this. And this can be one simple short statement. It might be a sentence that explains why you are holding the meeting. If appropriate, you may attach as an appendix any background information. You may attach things such as assignments, things to read, things to bring, things to do, things to prepare for, data to collect and so on so that when people come to your meeting, they are fully prepared to work effectively on your goal. In the absence of this, people come to the meeting unprepared. Sometimes surprised and then they spend your time preparing for your meeting during a meeting. This wastes everybody’s time. Steve Kaye: Expanding on the answer to that last question: An agenda certainly should also describe the process that will be used in the meeting. This is like your project plan for the meeting. This is like a project plan for the meeting. What are the steps that you’ll take? And to the extent possible, you might even describe people roles in the meeting. This can be very simple. For example if it’s a project review meeting, a recurring meeting then the process may simply be a schedule for the different presentations that will be given in the meeting. Perhaps with some question time, some discussion time between the presentations. So you noticed, it can be quite simple. It’s important though that this be specified so that people know what to expect. Steve Kaye: It also would include a time budget and this is your estimated times for the time that will be spent for each task in the meeting. This is useful because it gives people an expectation of how long you’ll be spending on different elements of the meeting. Some people approach me as if they have infinite time. Well there’s no such thing as infinite time. Time is a precious resource. When people know that there’s only so much time budgeted for a particular task, then they may work toward it and that helps to marshal the contributions and their participation and working toward it. Cornelius Fichtner: And how do you feel about time keeping and what do you if, say, you got 15 minutes allocated to something and you noticed during the meeting, 15 minutes is not going to be way, way not enough. It’s going to be half an hour. What do you do now? Steve Kaye: Sure, sure. Well recognize we live in a real world. Cornelius Fichtner: Okay, things never go as planned. Steve Kaye: We have to have a plan so that we at least have a direction for proceeding. And of course we recognize that plans are constantly being revised in the moment. So there are always surprises. Steve Kaye: Two things: First of all, I would ask somebody to help as a timekeeper. So I would find some participant who can help as a timekeeper just to keep track of how time is going. If you are the person running the meeting in attempt to do this, you are loading yourself up with tasks and every task you take on removes your ability to effectively manage the meeting. So the more you can delegate, the better. Cornelius Fichtner: You know I’ve never been in a meeting where this was done. In every single meeting that I’ve ever attended I think yeah, there was an agenda. There was a time budget for each agenda item. But nobody every looked at it. Nobody kept track of it and it was just nilly-willy. Steve Kaye: Think backwards. Is this the type of leadership that you would want to participate in? And you noticed there are some elements of what I’m doing. I’m alerting people about the realities. I am including them in identifying the solutions and I am gaining buy-in on the solution in real-time as I’m moving through this. When I do this, the net result is a far more effective leader. We make more purposeful progress. We have more buy-in. We have more agreement. Just in total have a far better leader. Without it, people are right in the dark. They have no idea what’s going on. They feel out of control and when people feel like that, when they feel out of control then they begin to act strange. And when they act strange, they begin to misbehave and the meeting deteriorates. Steve Kaye: And the third bullet says that an agenda should be sent before the meeting. This is critical. I realized, there can be exceptions. You may have an emergency where you must call a meeting immediately. However, if at all possible, the agenda should be sent at least a day before the meeting. And this is important because it allows people time to understand the agenda and then manage their participation so they come prepared to work with you toward your goal. Cornelius Fichtner: Yeah, how formal should an agenda be? I mean, do you have any recommendations as to when you send out just bullet list and an email: “These are the things we want to talk about” versus you create an actual Word Document, nicely formatted and you have a real formal agenda? Steve Kaye: Good question. The complexity, the completeness of an agenda will depend upon the goal for the meeting and the scale of the meeting. It’s almost as if I were to say: “We need a vehicle?” Well, what’s a vehicle? It can be anything from a skateboard, a bicycle with two wheels. Cornelius Fichtner: It has four wheels, yes. Steve Kaye: Or a bicycle that has two wheels and it’s self-propelled. It could also be a massive semi-truck, which can carry tons of materials across country, has a monstrous engine, has sleeping quarters. So it really depends on what you’re doing. Cornelius Fichtner: Alright! So the answer is as always, it depends. Look at what the purpose is of your meeting, the formality of your meeting itself and then decide whether it is sufficient to just send out an email with a few bullet points or whether you have to send out an actual agenda in a nice document. Steve Kaye: Yes. I recall earlier, I described the meeting that had no structure, no agenda, no goal. All I simple did was call a few folks and say: “The department is buying lunch for you.” So they came to lunch and they ate and they had a good conversation that helped the project. At the other extreme, I’ve organized project meetings that involved participants from other countries and these meetings took months to prepare for. I was in charge of project review meetings that lasted a week and involved 80 presenters people from allover the world. We would sent people recommendations on where to stay for hotels, medical facilities in the area, things that their families could do if they brought them. The amount of support, the amount of planning, the amount of detail for this was huge. However, this was the annual major project review meeting for an entire company. So a huge amount of thought had to go into it. It all depends upon what you are doing, what you want to accomplish and who’s coming. Steve Kaye: This is important because some people seem to think that they can argue their way out of this. Without a goal, without a purpose, without a plan, it is not a meeting. Actually, it’s a party. It’s just a freewheeling, fun-having conversation and parties so nice seldom produce business result other than maybe doughnut crumbs and empty cups. And no business can tolerate having this occur too often. Steve Kaye: Also important: An agenda truly matters and it matters for meetings reasons that go deeper than just you having a plan so you know what to do. Lack of a plan scares people. Imagine, sitting in a room where somebody asks: “Well, what do you want to do?” And you realize, you could be stuck in there for four hours having a pointless conversation. You realize, your time is about to be waster. Or maybe, you’re now vulnerable, subject to attacks or such by other people in the meeting. What do you do? Well you’re going to protect yourself and you’ll protect yourself by misbehaving in ways that make it impossible for other people to hurt you or you might retaliate by punishing the person who called the meeting. For example a manager told me that his Vice President would hold four-hour long meetings that accomplish nothing, no goal, no agenda. He admitted that he and his friends would sandbag the meeting by introducing irrelevant topics asking pointless questions and they would do this to make sure that nothing happen. They would entertain themselves by derailing the meeting. The other alternative is if people feel that they are under attack or they’re vulnerable, they hide. They sit there and say nothing. And if you’re holding meetings without goals or agendas, and you noticed that there are people just sitting there being very, very quiet, that’s what’s going on. It’s cruel. It’s pointless. Because what happens is in the absence of planning, some people rise up and they take over your meeting by dominating the whole thing with their stuff and then other people just go off and hide. That result when it’s all over, everybody’s unhappy. Cornelius Fichtner: And that’s it for your Free PDU Podcast sample. Please stop by at www.pducast.com that’s p-d-u-c-a-s-t .com to order your full subscription to The PDU Podcast™ and start earning at least 1 PDU every month.